This dish is so incredibly simple to make, but the results are exquisite. Serve with plain yogurt or, better, with Wild West Dressing.... In a pinch, bread crumbs from store-bought challah are fine too. 1. Finely grate the zucchini and onion. Wrap the grated vegetables in a clean dish towel and twist both ends over the kitchen sink to squeeze out all the excess moisture. 2. Combine the zucchini, onion, leek, dill, and bread crumbs in a large bowl. Add the egg and use your hands to mix everything together. Shape the mixture into 2-inch patties. 3. Add 1/2 inch of oil to a large skillet and heat over medium heat. Cook the zucchini patties in the hot oil until both sides are golden brown, 3 to 5 minutes. Drain on paper towels and season with salt. Einat Admony is a 21st-century balaboosta (Yiddish for “perfect housewife”). She’s a mother and wife, but also a chef busy running three bustling New York City restaurants. 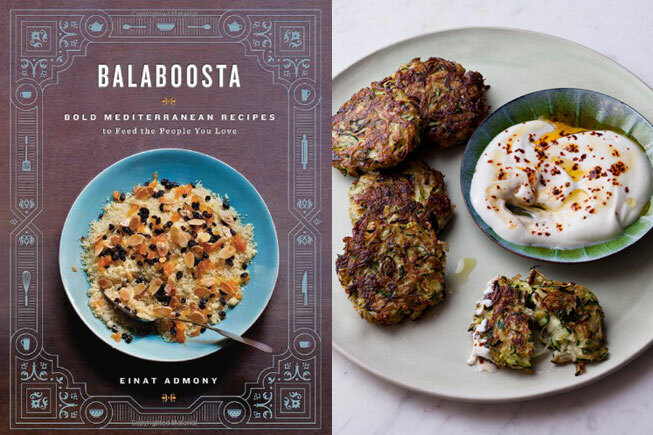 Her debut cookbook, Balaboosta, features 140 of the recipes she cooks for the people she loves—her children, her husband, and the many friends she regularly entertains. Browse more Amazon Books editors' picks for the best cookbooks and more guides to Holiday Entertaining.